What a beautiful post! The color is amazing and so is your garden. Your new header photo is a great fall delight. Thanks for sharing. Thanks Stepheny. Those Monarchs do have beautiful coloring. I chased them around all afternoon trying to get them to pose. Wonderful photos! They look so good posing on your Lantana, very colour co-ordinated! You sound like me, running round the garden with a camera in hand, trying to photograph the butterflies. Pauline, I guess that phrase, “chasing after butterflies,” came from life experience. These monarchs were rather skittish. Beautiful shots. How lovely they look on the matching Lantana. The monarchs do match that Lantana pretty well. 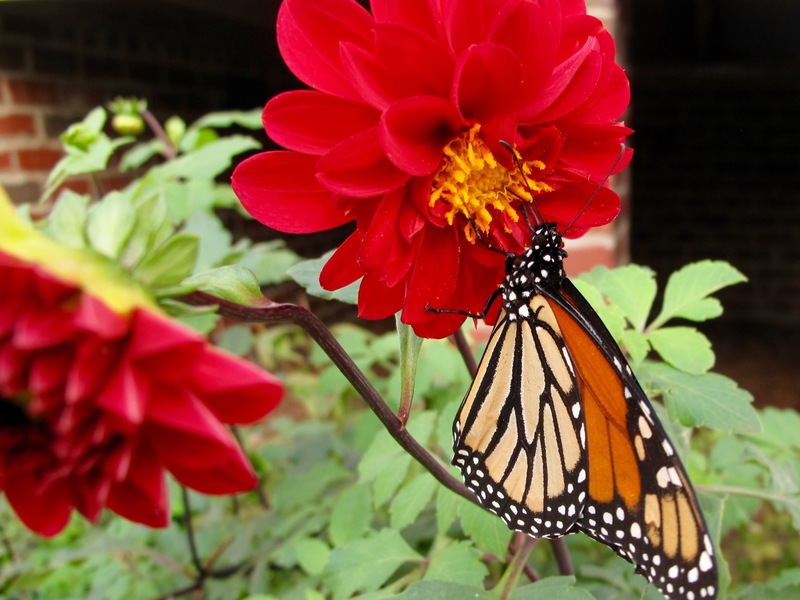 I thought the juxtaposition with the red dahlia was jarring, but the butterfly liked its nectar anyway. I haven’t seen any yet, but I’m looking hard. Good luck with the hunt. I started seeing some in July, only occasional ones. Would love to see trees covered in them! Beautiful photos Susie. They look so pretty on your Lantana flowers! It must be such a pleasure to see more Monarchs as they pass through on their long journey south. 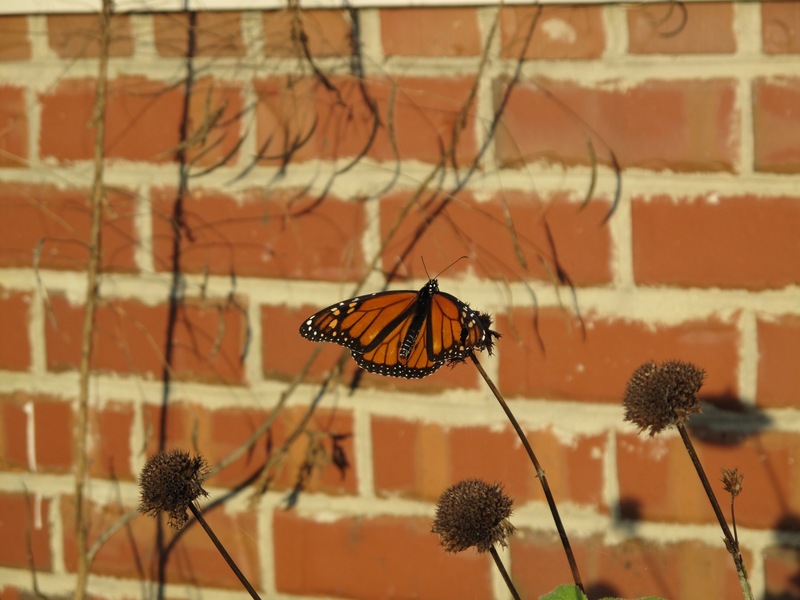 Cathy, seeing the Monarchs makes me notice and appreciate the cycle of life like nothing else. It’s like a gift to find one enjoying my flowers. Wonderful photos. 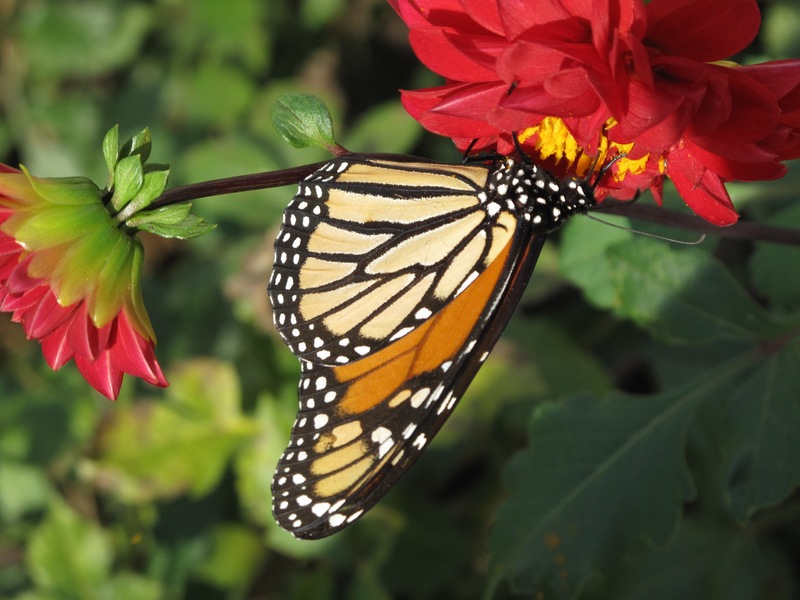 I especially love the Monarch hanging upside on the red dahlia. What poise. Thanks. The monarchs seem to overcome gravity. They’re really fun to watch. Beautiful photos! It’s so wonderful to follow their progress migrating south–by following blogs along the path. We still have a few here in the north, but their numbers are dwindling with the cooler weather and northerly winds. Thanks Beth. I saw monarchs here earlier than ever before but never more than about 5 at a time. Interesting you’re still seeing them up north. Judy, I’m so glad you enjoyed seeing the monarch pictures. I’ve taken about a zillion in the last 2 days. Such vivid colors! I love the lantana and wish I could grow them here as a perennial. I think it’s just too cold. The butterflies really look stunning against the flowers. Thanks Stephi. 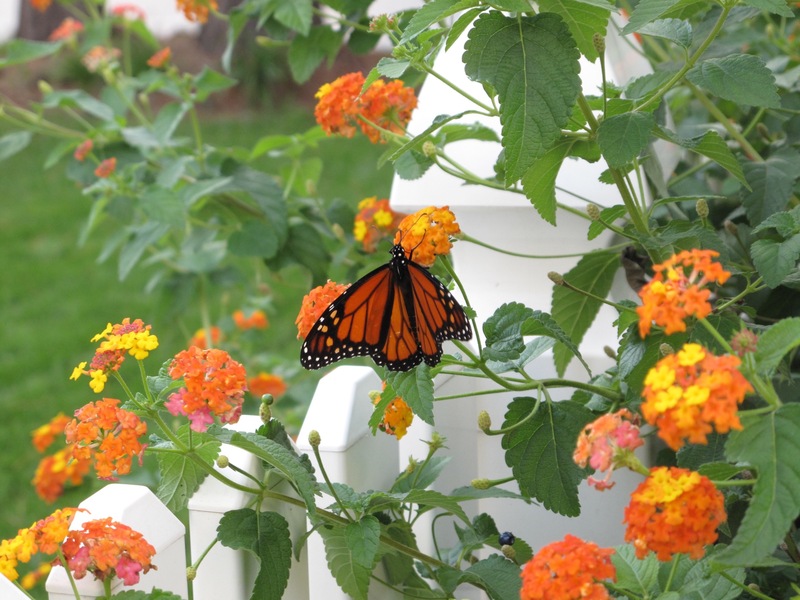 The lantana attracts all manner of butterflies and other insects and is carefree. Do you plant it as an annual? I’ve used it in pots as an annual. Saw it in as mass annual planting at the Chicago botanic gardens so may try it next year. Looks tough to grow from seed. Thank you. Those butterflies didn’t want to sit still very long. Wonderful photographs, especially that last one. 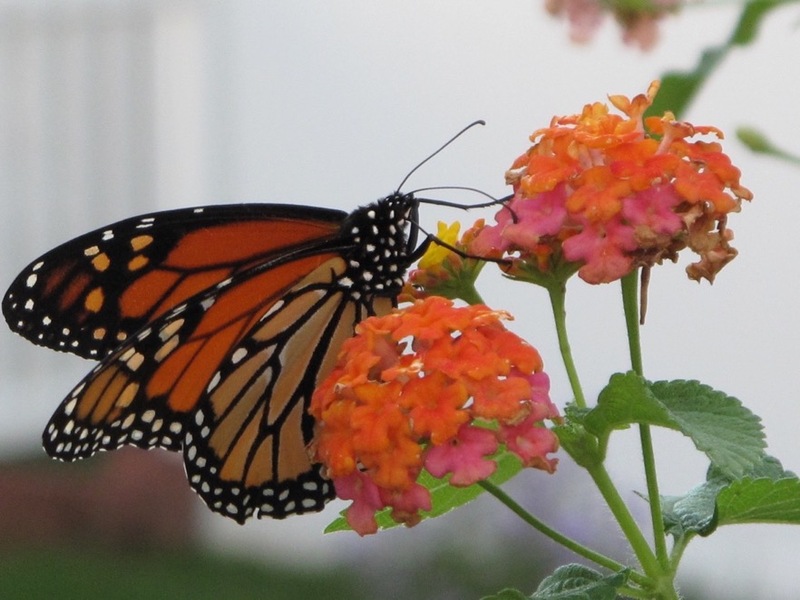 How do you tell the male from female Monarchs? Thanks! 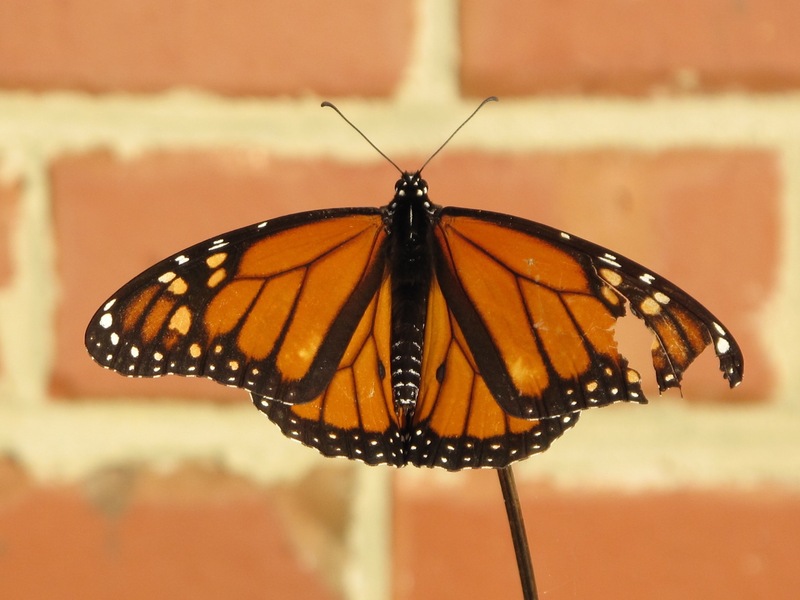 The female monarch is missing those two black spots (one on each hindwing) that the male has. Also the black outlines are thicker on the female. Sounds like how the monarchs were visiting here….